While playing at online gambling establishments such as online casinos, poker rooms, bingo halls and sports betting sites all your betting and credit card transactions are encrypted which offers the player an extremely secure environment to transact in. However, the big flaw in the system comes when you need to send your verification documents to the company you are transacting with. You would normally have to either fax or email your personal and sensitive verification documents through to them. As most of us know this is not an encrypted method and your documents are at risk of being intercepted by unscrupulous parties. If you play at many different sites you would be required to upload your personal documents to each company, with the associated security risks each time. Thanks to a new company called Player Verify, this whole process may be about to change. 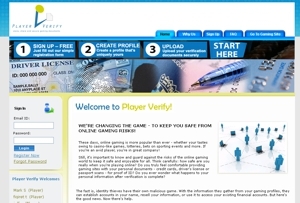 Instead of putting your personal documents at risk of interception by identity thieves you simply sign-up with Player Verify, create your profile, upload your verification documents and send a request to your gaming site to view and verify your documents on the Player Verify site. The gaming site would then simply click on the secure link that you provide to them, log-in to the Player Verify system and view your documents. If you sign up today you get a 30 day free trial. Full membership will cost you $0.99 per year. A small price to pay for the added security and convenience.